The sanctuary of my church is very beautiful and orderly. There is a perfectly centered communion table adorned with an ornate tapestry tablecloth and symmetrically-placed candles, all surrounded by a symmetrical communion rail. Care is taken so that two fresh flower arrangements complement the colors of the tablecloth. The flowers arrive from the florist on Saturday morning, and I witness our altar guild members placing them on their symmetrical pedestals, and stepping back to enjoy the view. Because I am standing there, I am directed to move this one an inch to the left…(no that is too far) … (back the other way a half millimeter) …(rotate the arrangement another 2-1/2 degrees clockwise) … (there, that is better)! Behold! Centered high on the wall behind this display is a large and magnificent circular window, completely filled with the cross of Christ dividing the window into four quadrant-shaped window panes, unequal but still orderly and symmetrical. There are tall and majestic trees visible through this window. As we worship we can commune with God in nature as we witness the foliage responding to the changing seasons, and as we witness dark and light as the Earth rotates on its axis. All of this is good. 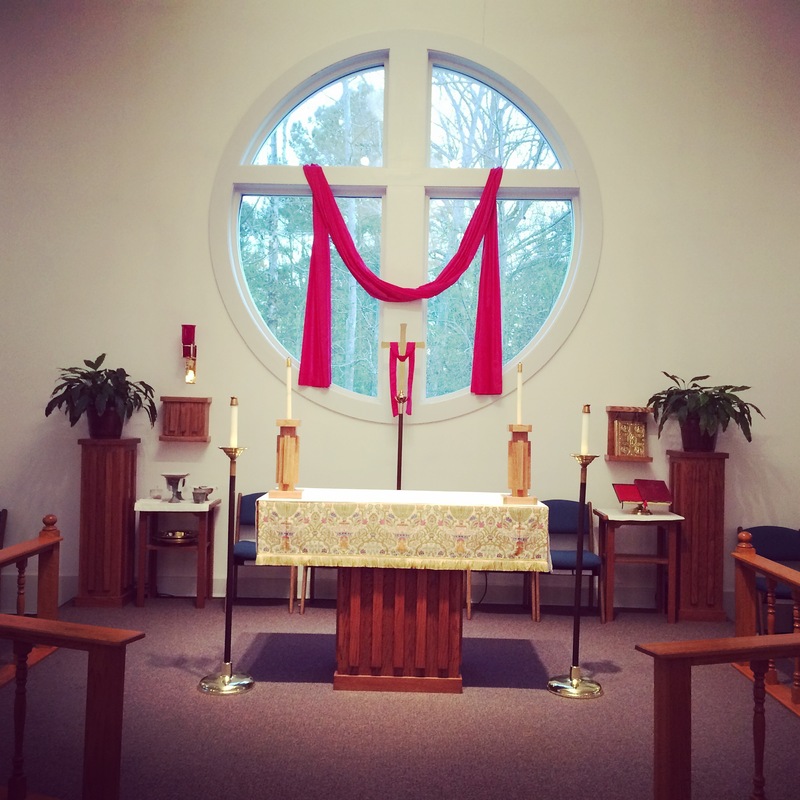 Episcopalians thrive when order abounds, not only by recognizing beauty in their orderly surroundings, but in their own proper behavior during their worship services. Perhaps maybe a little bit of spontaneity to defy our rigidity! But not too much to upset the apple cart of our proper decorum! Orderliness is next to Godliness! Alas! There is a long vertical crack in the drywall in the sanctuary of my church. This crack starts near the top edge of our large Cross-filled circular window about 8 inches to the right of center. Due to the steeply peaked ceiling, this crack is able to extend up the wall to a magnificent height. The juxtaposition of the imperfection that this crack creates in such an otherwise orderly sanctuary holds profound theological and spiritual significance for me. “I belong!” For the years I have worshipped at St. Julian’s, my eyes are drawn to this crack, and I am reminded of my own brokenness. I am also reminded of the brokenness of God, how God freely chose to be broken through incarnation because of the immensity of His love for us. And I am overwhelmingly filled with the love of God, and with tears and gratefulness! The crack in the wall is also right of center. Being a person who tends to be left of center in most things, this crack reminds me that God is not created exclusively in my own image: that God can be found in the center and both right and left of center. This reminds me to not settle into a fundamentalist position pertaining to left-centeredness. Oh, you humble crack! I honor your place in our sanctuary. You have done a glorious job of holding God in your crevasses, of reminding us that God is to be found in all places, low and high. God is truly in the cracks (and crackheads) of our world. Our broken world is one of sheer beauty in all of its manifestations! I glanced through the minutes of the last vestry/business meeting. 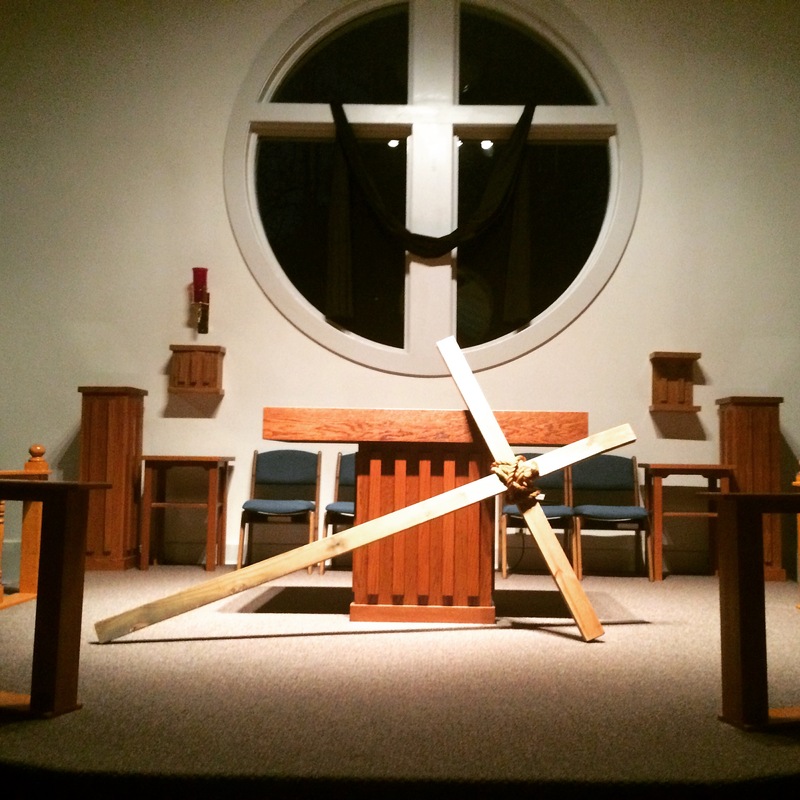 It appears that the vestry is determined to reestablish beauty and order in our sanctuary. It is deemed, dear crack, that you have got to go. My beloved crack, I will miss you! I grieve for you. I believe that you are beloved of God as well, just as God loves all creation. Being on the fringe of this church with no hope of influencing policy, I feel powerless to save you. But maybe, with God’s grace, your death could be delayed by having you fall a little lower on the priority hatchet list. That would give us more time to say good-bye to one another. As you know, dear crack, there is much brokenness in this world and you and I both are to be about the work of Christ. Perhaps unbeknownst to you, you have lived out your life in service to Christ; I am witness to this. You remind me to live for Christ as well. And just as Christ ultimately gave his entire life for us, I have to be willing to allow you to do the same. I will remember you as long as I live. Come, Holy Spirit, that I may give my life more fully for Christ as well. The wall will be “repaired” one day soon, but I will look upon your ghost and remember. That was great! I hope we don’t fix the crack too soon! Thank you for this… I can hear Lindsay’s voice as she writes.